Nous sommes à 15 minutes à pied ou à 3 minutes en voiture de la plage Marriott Morning Star. Notre studio gai et climatisé de 70 m² vous accueille pour que vous vous sentiez comme chez vous. Construit sur un grand terrain tropical, la vie privée n'est certainement pas un problème. Portes françaises s'ouvrent sur le grand balcon où vous pourrez vous détendre, profiter des couchers de soleil incroyables, regarder les bateaux de croisière naviguer ou simplement savourer les brises tropicales. This not so little studio is just minutes to anything you want. Super clean and fully furnished. Just don't be afraid of the steep road. Just use your lower gear. Thank you Corlette for being such a nice host. I, my wife, and our two adult children spent 11 fabulous days in the USVI. We stayed in this magnificent studio which, despite its name, had plenty of room for all four of us. The property is centrally located so getting to and from beaches all over St. Thomas (and Water Island) was a breeze. The place came with a fully equipped kitchen (including spices! ), lots of bath and beach towels, beach chairs, washer and dryer, and an extra blow-up queen size mattress (which we used). Best of all, Corlette, the owner and hostess went out of her way to ensure we had a great time. In fact, the first night we were there we decided to go to the grocery store. On the way back we got a bit lost and I called Corlette to ask for the specific address to put into our GPS. She gave us that and immediately offered to come and lead us back to the place! We managed to get back without her generous offer but her offer-to-help-without-hesitation was very comforting. Toward the end of our stay as he brought us fresh bread that she had purchased from a local bakery. Corlette, you are the best!! We will definitely hope that this place is available when we return; and we do intend to return to this magical paradise. A great base of operations for your island adventure! This place is exactly as pictured and advertised. The owners are great people who take pride in their property and this well-appointed studio will not disappoint. The bed is comfortable and the unit is equipped with everything you need, including beach towls, chairs and even a cooler! The kitchen is well-stocked, and the owner thoughtfully provided coffee pods, bottled water and a selection of spices to get you started, make cooking easier and reduce your grocery bill. Even though its a studio you have tons of space, including a really large bathroom and walk-in closet. 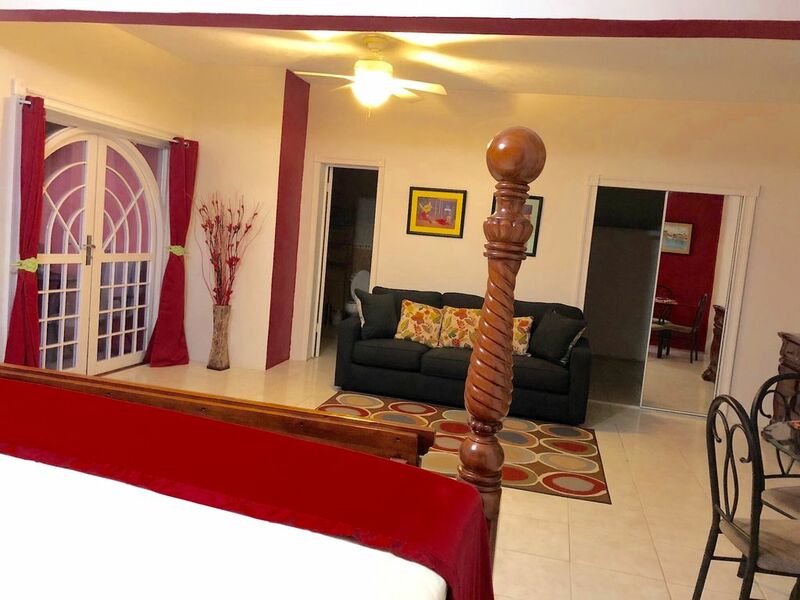 If you are looking for a clean, comfortable place to stay during your time on St. Thomas, then you will be hard-pressed to beat this centrally-located gem! Great place, clean and comfortable. Lovely views from this studio. Hosts provide beach towels and chairs also. Good location. Could be an issue for those with mobility issues as it is on a very steep hill and driveway is very steep too. Very nice owner who thought of everything her guests may need during their stay. This is a spacious and comfortable place to stay. Very convenient location for what we had planned for the week.